New study findings may explain why prostate cancer becomes resistant to androgen deprivation therapy. 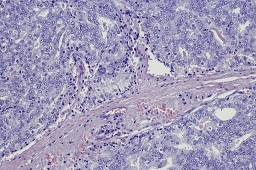 Development of castration-resistant prostate cancer (CRPC) may be due to a lack of androgen receptor expression in prostate cancer cells, identifying a potential new therapeutic target, according to a new study. Writing in Nature Communications, investigators report that to survive the pressure of chemical castration, PCa cells overexpress, redistribute, or lose androgen receptors (AR). AR-targeted therapies stop or inhibit the growth of PCa cells, but for unknown reasons, their effectiveness is usually short lived. Within 1 or 2 years of androgen deprivation therapy (ADT), CRPC develops. Dean Tang, MD, PhD, Chair of Pharmacology and Therapeutics at Roswell Park Comprehensive Cancer Center in Buffalo, New York, and colleagues examined AR expression patterns in approximately 200 CRPC cores and whole-mount sections from 89 men with CRPC. They found 3 distinct types: AR in the nucleus of the cancer cell, AR in both the nucleus and cytoplasm, and near or complete absence of AR from all parts of the cell. PCa cells that express little androgen receptor (AR-/lo) are intrinsically different from AR-expressing (AR+) PCa cells. They proliferate faster than AR+ cells in androgen-deficient conditions, and they are more tumorigenic in androgen-ablated hosts, Dr Tang explained. As part of their current investigations, Dr Tang’s team confirmed that cells lacking AR did not respond to treatment with the commonly prescribed AR antagonist enzalutamide (Xtandi). These PCa cells were also more likely than AR-containing cells to grow, regenerate, and proliferate. Through in-depth RNA-Seq analysis, the team identified BCL-2, a stem-cell-enriched prosurvival molecule, as a critical regulator and important therapeutic target in CRPC cells. His team’s latest findings provide a proof-of-principle novel therapeutic strategy to co-target AR+ prostate cancer cells with enzalutamide and AR-/lo prostate cancer cells with a BCL-2 inhibitor. The combined treatment with enzalutamide and ABT-199 (venetoclax), a newly FDA-approved BCL-2 inhibitor, markedly inhibits experimental CRPC. Dr Tang and his colleagues have initiated a phase Ib/II clinical trial based on these findings. David Wise, MD, PhD, Assistant Professor of Medicine at the Perlmutter Cancer Center at New York University Langone Health, said the finding that BCL-2 may be a candidate therapeutic target for mCRPC is intriguing. “The science presented in this elegant manuscript contributes to an accumulating body of work supporting loss of androgen receptor expression as a bypass mechanism that drives castration-resistant prostate cancer and resistance to the androgen signaling inhibitors, enzalutamide and abiraterone,” Dr Wise said. Li Q, Deng Q, Chao HP, et al. Linking prostate cancer cell AR heterogeneity to distinct castration and enzalutamide responses. Nat Commun. 2018;9:3600.